How to clean your pergola fabric? Dickson® pergola fabrics generally offer a high level of protection from external factors, such as the wind, sun, rain, micro-organisms, dust and other sources of pollution. Examine and clean your fabric regularly to maintain its esthetic and technical properties for longer. You are recommended to check your fabric after exceptional events such as major storms, heavy snowfalls or hailstorms, objects falling on to the fabric, long periods in storage, and prolonged exposure to unusual levels of air humidity. > Rinse dirt attached to the surface using cold or hot water. For fabric with stubborn stains, a high-pressure cleaner with a wide jet angle may be useful. > Apply a cleaning product by spraying it or by applying with an appropriate accessory (sponge or cloth for example), diluted to a level appropriate to the amount of dirt. 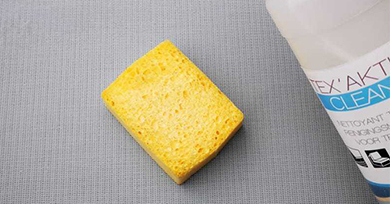 > Leave to work on the surface for a maximum of 5 minutes and then wipe with a soft cloth or sponge. 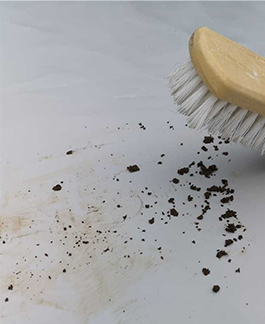 > Clean very dirty surfaces with a soft brush. > Rinse off the cleaning product and dirt with clean water (hot or cold) until all of the product has been removed. > It is very important to dry the surface or leave it to dry completely after cleaning. Clean fabric regularly to prevent it from becoming dirty. 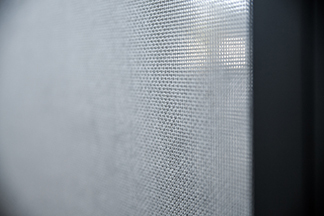 If you are unable to remove the dirt, cleaning may be impossible if it has partially penetrated the membrane. Deep clean the fabric using Tex'Aktiv Clean. This will restore your fabric’s original resistance to water and dirt. Under all circumstances, coated fabrics must be cleaned and completely dry before storage, as should the place of storage.